A teenage Carlos Acosta won the Gold Medal at ballet’s prestigious Prix de Lausanne 25 years ago, and his skill and finesse has wowed audiences ever since. He officially retires this season, and while he will be missed, his move from ballet star to director/choreographer/philanthropist has been a textbook career transition. It includes his own shows, film appearances, an autobiography, a charitable foundation, a CBE, and full-length productions including Don Quixote for the Royal Ballet (2013), and Guys and Dolls for Chichester Festival Theatre (2014). Now comes his Carmen, that Acosta both choreographs and stars in. It is a 60-minute, chamber-scaled version of the love triangle, with pared-back contemporary sets, a compact arrangement of Bizet’s score, and the dance-drama filtering out all but Carmen and her two lovers, the bullfighter Escamillo and the luckless Don Jose. The first night cast is faultless, with Marianela Nunez as Carmen, Federico Bonelli as Escamillo and Acosta as Don Jose all proving their considerable artistry and flair. Nunez in particular shines as the fearless heroine, but what the production lacks is the grit and grime of her world. 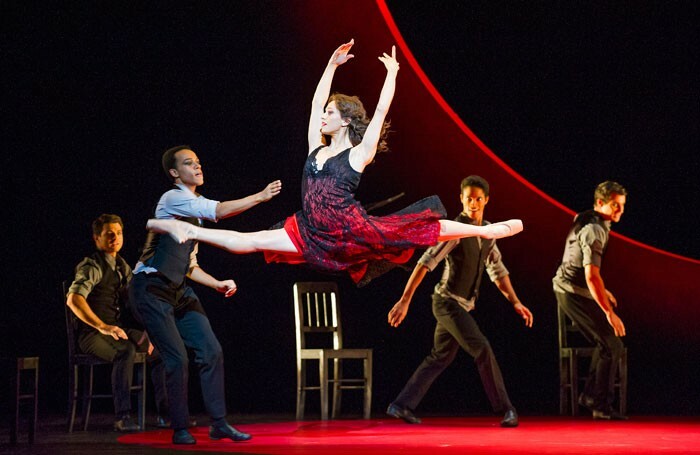 It is too clean, too efficient, with the slick black costumes and choreography lacking the languor and romance of Carmen’s story. It also feels of its time, meaning it may date, especially without the cast on which it was made. Also on the mixed bill is Liam Scarlett’s Viscera (2012) and the modern classics Afternoon of a Faun by Jerome Robbins (1953) and Tchaikovsky Pas de deux by George Balanchine (1960), all proving the Royal Ballet’s range and enviable repertory.